Jean-Philippe RAMEAU: Premier Livre de Pièces de Clavecin (1706); Pièces de Clavecin (1724); Menuet en rondeau (ca. 1724); Nouvelles Suites de Pièces de Clavecin (1728); La Dauphine (1747); Les petits marteaux (nd). Mahan Esfahani (hpsi). Hyperion CDA68071/2 (2 CDs) (http://www.hyperion-records.co.uk/). 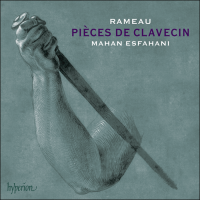 Esfahani’s complete Rameau moves towards the front of a crowded field. He is appropriately grand with clean, stylish playing. Of note are the manual and registration changes, and that he will try the damper for trios and repeats. It’s possible to hear Esfahani maturing as does Rameau: The later pieces are less severe and more robust. Also, the different tuning systems for the 1636/1763 Ruckers-Hemsch contribute to this perception. The earlier suites are in 1/5th comma meantone or 1/6th comma meantone, the later suites are in 1/8th comma temperament, and La Dauphine, the latest piece, is in equal temperament. Esfahani plays La Dauphine like an encore, operatically. “The Keyboard Works.” Jean-Philippe RAMEAU: Premier Livre de Pièces de Clavecin (1706); Pièces de Clavecin (1724); Nouvelles Suites de Pièces de Clavecin (1728); Menuet en rondeau (ca. 1724); La Dauphine (1747). Marcelle Meyer (pno). Erato 0825646257997 (2 CDs) (http://www.erato.com/). These are some of the most marvelous Rameau recordings of all time, yes, even on piano. Meyer’s crystalline touch delivers strikingly variable dynamics and incredible insights into phrasing. Tempos may be speedy for some, but Meyer’s elegance is indisputable. 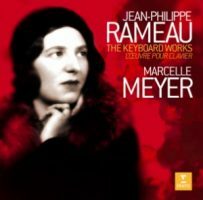 We may know Meyer today for her Rameau and other Baroque items, but she was a favorite of Ravel, and in her time (1897-1958) was famous for her association with Les Six, and for performing Poulenc and Stravinsky. These two discs (73:52 + 74:18) reissue her “complete” Rameau from 1953, and 11 additional Pièces recorded in 1946. “La Cigale et les Violons.” Denis GOUGEON and Jean-Philippe RAMEAU: Var. pieces. 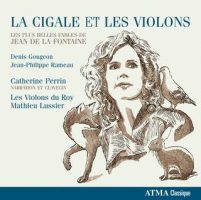 Catherine Perrin (hpsi, narrator), Les Violons Du Roy, Mathieu Lussier (cond.). Atma ACD2 2693 (1 CD) (http://www.atmaclassique.com/). A pleasant exploration of Jean de la Fontaine’s fables interwoven across pieces by Rameau and Denis Gougeon. Perrin is both speaker and harpsichordist. You will have to understand French, of course. Nine fables are told across a 16-part suite; Gougeon tells two stories purely with music (The Hare and the Tortoise, The Ant and the Grasshopper). Several Pièces de Clavecin en Concerts movements appear as interludes (La Forqueray, La Livri, La Pantomime), often with adjusted instrumentation to make full use of the string orchestra. Gougeon’s style is thematic, jazzy and charming, recalling darker shades of Poulenc or Martin. 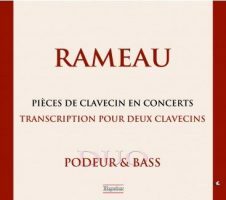 There are six extra Rameau items: three solo harpsichord Pièces, an orchestration of La Poule and two ensemble versions from the Pièces de Clavecin en Concerts. Yes, I would want to hear more Gougeon and Rameau from these folks, but perhaps separately. Jean-Philippe RAMEAU: Pièces de Clavecin en Concerts (1741; arr. Mireille PODEUR & Orlando BASS, 2014). Duo Podeur & Bass: Mireille Podeur, Orlando Bass (hpsi). Maguelone MAG 111.190 (1 CD) (http://www.maguelone.com/). Little can beat the crackle of two harpsichords in precise synchrony. Podeur and Bass’s zesty arrangement is invigorating, tending speedily towards augmentation. They began by combining the viol and second treble parts, and then realized the music suggested further possibilities. If a gesture is repeated, it will be echoed by the other instrument with increased ornaments and trills, possibly even at a slightly faster clip including extra improvised filigree. Evidence of their aggrandizing includes cleverly overlaying themes from La Poule and L’Egyptienne into harmonically similar sections in La Rameau. Thankfully the instruments are a matched pair. One is a Flemish instrument extended by Joseph Collesse in 1748 and restored by Laurent Soumagnac, and the other is Soumagnac’s copy of the same. 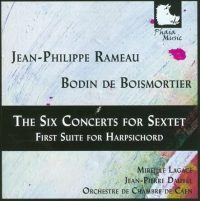 Jean-Philippe RAMEAU: Six Concerts en Sextuor (1741; arr. 1768?). Bodin de BOISMORTIER: Première Suite pour le Clavecin (1736)*. Mireille Lagacé* (hpsi), Orchestre de Chambre de Caen, Jean-Pierre Dautel (cond.). Phaia PHU039 (1 CD) (dist. by http://www.naxos.com/). Here’s a no-frills repackaging of late 1970s tapings first released on Calliope of the string sextet arrangements of the Pièces de Clavecin en Concerts which includes an additional sixth concert fashioned from pieces in the A minor keyboard suite. This recording’s studious manner suggests its age, but some movements, such as La Poplinière and the Tambourin in the third concert, simply feel too slow. There is no harpsichord in the Concerts, but the disc is fleshed out with Boismortier’s First Suite for harpsichord regally played by Lagacé, which provides the incisive attacks missing from the Rameau. Jean-Philippe RAMEAU: Pièces de Clavecin (1724); Nouvelles Suites de Pièces de Clavecin (1728); La Dauphine (1747). Blandine Rannou (hpsi). Alpha 309 (2 CDs) (http://www.outhere-music.com/). This reissues the 1724 E minor and D minor suites, the 1728 A minor and G major suites, and La Dauphine from a larger, four-disc set first appearing in 2000 that also included the Pièces de Clavecin en Concerts. 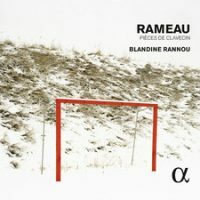 Rannou’s playing is among the most distinctive and quirky Rameau around. Slow movements like the Allemandes are very slow, whereas Rannou’s overall attitude is nearly unschooled and extraordinarily unsolidified. Fast dance movements (e.g., the Rigaudons) will be perky, and La Poule’s chickens are lethargic. The 1724 Pièces are on a Ducornet copy of a 1624 Ruckers, the later suites on a different Ducornet which copies a Hemsch. Tuning is not specified, but it’s not equal temperament.